Park Shin Hye left for Beijing, China earlier today to attend the Tokyo Girls Collection fashion show in which she will take part in the event as a model, modeling the latest collection of one of the designers in the show. 신혜는 지금 공항에서 대기중~!! 1시반에 북경으로 슝슝 날아갑니다- 떨리네요>_<잉잉~ 그리고 소속사에서 트위터를 못하게한다는 말도안되는 이야기는 이제그만.. 속상하게 그러지말아줘요.. 나를위해 보이지 않는곳에서 누구보다도 더 열심히 일하는분들이세요.. 그럼!!! 신혜는 조심히 잘 다녀오겠습니다~~~!!! Shin Hye is now waiting at the airport~!! Flying to Beijing at 1:30pm-So excited >_< syung syung~ Please stop saying that my agency has banned me from using Twitter. It's untrue, please do not hurt anyone's feelings.. I will work harder in the future.. Alright!!! Shin Hye will be careful and stay safe on my trip~~~!!! The picture above was attached, of Shin Hye looking absolutely beautiful as she waits for her plane to depart. At around 2:30 pm Korean time, her plane left for Beijing. 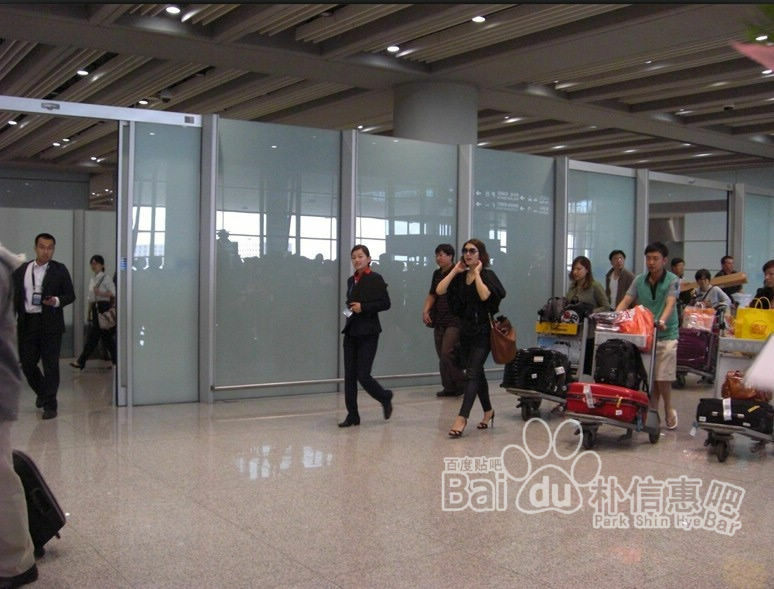 Upon arriving in Beijing, she was greeted warmly by many of her Chinese fans from PSH Baidu Bar. A bright smile could be seen on Shin Hye's face as she walked out of immigrations to the many fans awaiting her. She wanted to stop for autographs but ushered her along due to her safety. "All people saw her at the airport said she is very very very lovely and beautiful^^"
"Shinhye was smiling to us"
Today was a great day for the many Chinese fans who were able to welcome Shin Hye at the airport. Tomorrow, she will be walking the runway as a model. We wish Shin Hye a great and joyful time in China. Oh my G! She looks like a REAL elegant lady.In fact,she IS an elegant lady.SO CUTE!!! WOW very very very very pretty with a brigth smile....i like you Mss:PARK SHIN HYE...take care..